CES, the Consumer Electronics Show is the global stage for innovation. Each year, hundreds of thousands of people gather to see what thousands of exhibitors showcase. CES is a window of what the future will look like. We were among the 182+ thousand visitors of CES 2019. We travelled from Greece all the way to Las Vegas with one mission: define the trends and industries that drive the touch sensor industry. Without further ado, we present to you the driving forces of the touch industry with an interesting, clever or quirky example for each one. In November the hype around flexible smartphone hit its peak. Samsung was teasing a flex smartphone, when out of seemingly nowhere Royole beat it to the punch, announcing world’s first flexible smartphone. 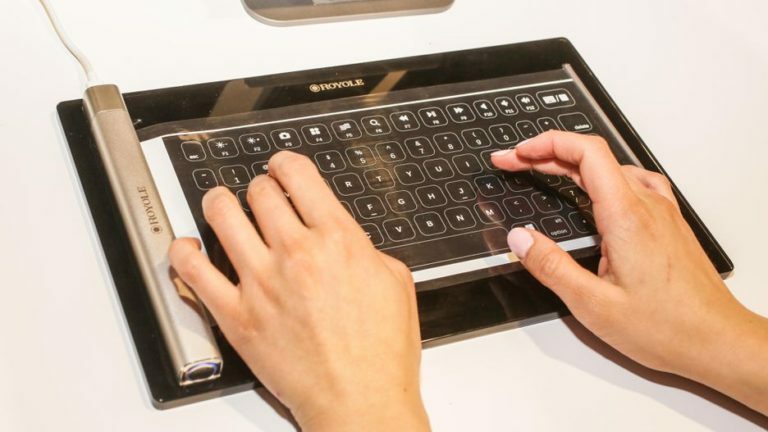 CES proves that the flex touchscreen hype is still here. -A flexible QWERTY keyboard. It works on every flat surface and connects to your tablet/smartphone/laptop via bluetooth. Once you’re done typing, you simply double click a button and it rolls, so you can easily carry it around. -A selfie stick, with touch sensor controls on its base. You can use them to control a dedicated camera app, making your selfie game stronger than ever. -A smart speaker with a flexible touchscreen. It features both Alexa and Siri, allowing you to control your smart home devices. It also has a camera, so you can take the occasional photo, or take video calls on the device. 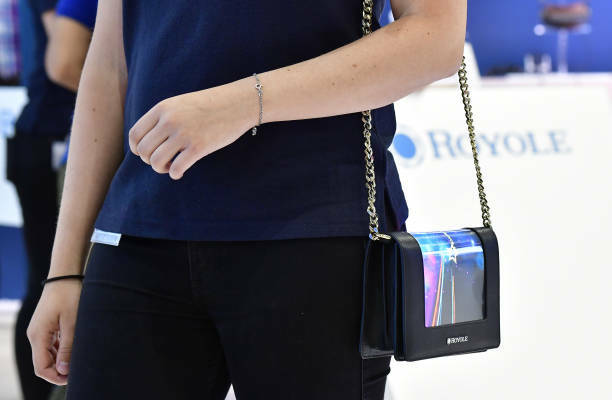 -A purse with an integrated flexible touch screen. Now you can take your high fashion flexing to a whole new level. The flexible form factor finally unleashes touchscreens from flat-only surfaces to every conceivable one. Designers and engineers will have more freedom than ever and will be able to implement touch screens in products we have seen them never before. High (tech) fashion. Courtesy of gettyimages. Touch sensors have been slowly gaining momentum as primary means of Human-Machine Interface (HMI) in industrial devices for some time now. If CES 2019 is an indication of the future, we can safely predict that this trend will become much stronger in the near future. Many industrial devices featured touch sensors as part of their primary HMI, like a sewing machine, but the device that created the most buzz is Wilkinson Baking’s BreadBot. 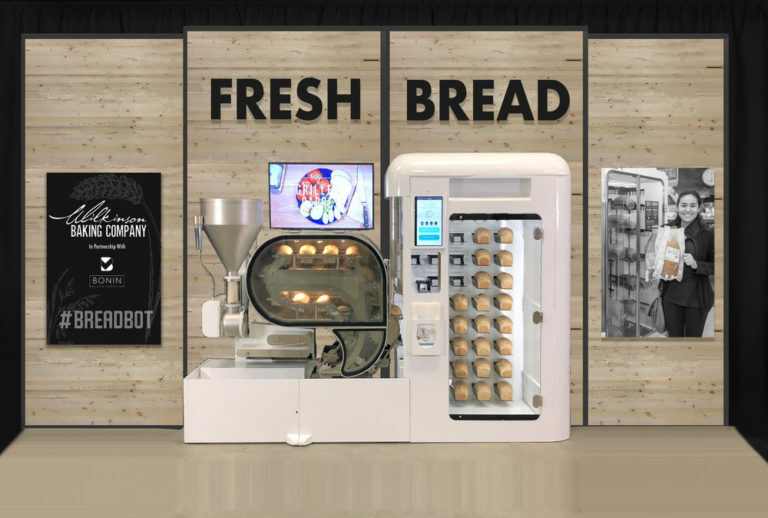 BreadBot is a fully automated bread making machine. It will dish out different kinds of loaves, at a rate of 10 per hour. Its main HMI means is a touchscreen that shows various information about each loaf (such as type or freshness) and lets you control pretty much every aspect of the production. The sturdiness and robustness of the touchscreen will be the key to the overall user experience of the device. The Breadbot in all its glory. Image by Wilkinson Baking. Wilkinson Baking says it can give retailers up to 1900% increase in profit, by eliminating the costly established process. However, owning one won’t be cheap. Industry experts estimate you’ll have to spend about $100,000 for a 5 years lease. That’s a lot of dough. One of the biggest chunks of CES was the smart home market. Some of the biggest players, like Samsung and LG included smart home appliances in their keynotes. Other devices included washing machines, alarm clocks and even…smart toilets! Our favorite smart home device with a touchscreen looks simple on paper, but that’s what makes it highly functional. 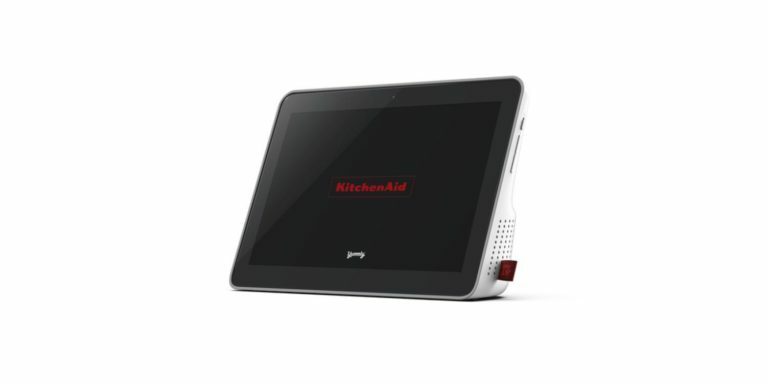 It’s KitchenAid’s Smart Display. It’s a bulky looking device with thick bezels, a 10’’ touch screen and 4 loud speakers on its sides. It seeks to solve a problem most of us have faced. Ever found a recipe online, but were afraid of damaging your tablet if you brought it to the kitchen to execute it? Then the Smart Display is for you. If you’re like me, creative in the kitchen (read: extremely messy), then you’ll appreciate this next feature of the Smart Display. It’s IPX5 rated. This means that you can simply rinse the device with faucet water, as it’s able to withstand that! So, if things get dirty, you’ll be able to easily clean it. We love touch screens that survive in harsh environments! The icing on the cake is that it also supports Google Assistant integrations. So, while cooking you can execute practical tasks, like setting timers or playing music and controlling the smart devices in your home. “Hey Google, show me a recipe with SmartBot bread.” Who knows, this might be a phrase we’ll use in the future! Many have expressed the opinion that CES is slowly turning into a motor show. CES 2019 wasn’t lacking in automotive announcements. Major ones include self-driving cars and LiveWire, the much anticipated Harley Davidson’s electric motorcycle . But for us, the one that stood out was the new Mercedes CLA. Ola Kallenius touted the new model as “the best compilation of our [Mercedes’] gadgets”. And it certainly looks like it lives up to the title. The new CLA dashboard is full of touchscreens. Source motorauthority.com. Touchscreens dominate the car’s interior. A pair of 7.5 inch touchscreens (upgradable to 10 inches if more screen real estate is what you like) act like both the dashboard and the multimedia hub of the car. Touch controls don’t stop there. You can also find touch buttons on the steering wheel and a touchpad between the front seats. The whole multimedia system is tied together with the Mercedes MBUX infotainment system. It offers extra cool features like compatibility with smart watches, so it can collect health data and monitor the driver’s physical parameters (e.g. heart rate). If the algorithm behind it deems it appropriate, then it automatically chooses the energizing package, toggling specific settings on the air conditioning, the ambient lights, stereo and even massaging! To keep your hands less occupied with things beyond driving, MBUX also features voice recognition and voice commands. Indeed, the CLA’s interior has all the traits of a high end gadget. Looks like Laptops won the Laptop vs 2-in-1 (laptops with detachable keyboards) war. At Least that’s the idea we got from CES. 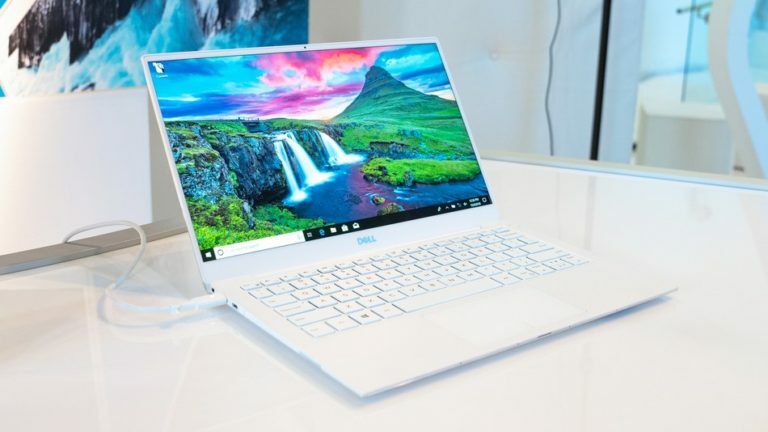 While most of the laptops presented in this year’s CES looked like last year’s, there were some exceptions that turned heads, coming mainly from Asus (the models Studiobook, ZenBook S13, Chromebook Flip and Rog Mothership) and Alienware (models M17 and Area-51M). Most of these models had a touchscreen. Which means that even though the 2-in-1 design might be forgotten, touchscreens in a laptop is something that customers have come to expect. Our favorite touchscreen laptop was no other than the Dell XPS 13. Its brilliant, almost bezel-less InfinityEdge display comes at 13.3 inches and supports 4K resolution. This, coupled with the newly positioned camera makes it one of the most beautiful laptops out there. The challenge that occurs as laptop sizes go up is that implementing touch screens might require different materials than those used in smartphones, such as metal mesh. CES 2019, before closing its doors on the 11th of January gave as a window to the future of technology. In a few years, many of these technologies might be the new norm. Whether or not our predictions come true remains to be seen. What’s certain is that the touchscreen industry is moving faster than ever. More and more products integrate touch screens and touch sensors. So, touch sensor companies should double down their efforts in 2019, if they aspire to gain market share and grow exponentially.